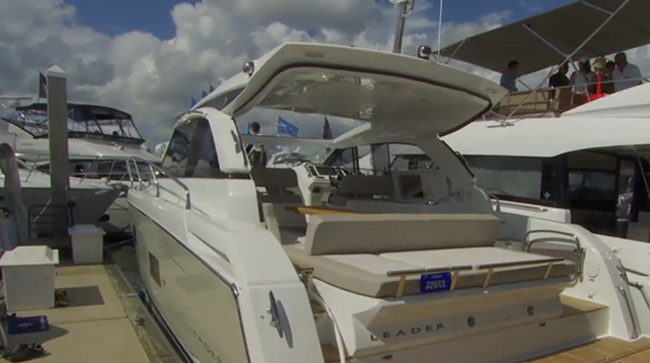 Alex Smith examines the new 33-foot family cruiser from Jeanneau’s five-strong Leader fleet. 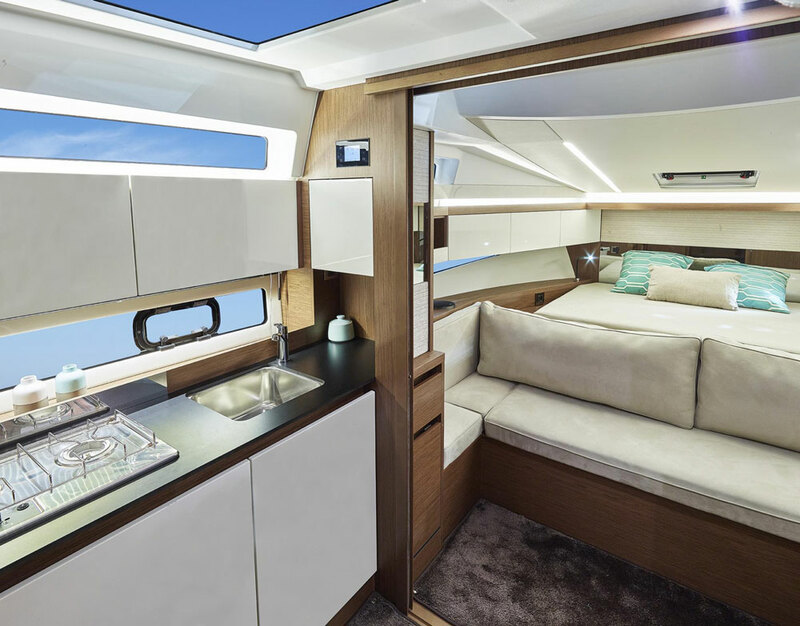 Having witnessed the debut of Jeanneau’s Leader 30 at the Cannes International Yachting Festival in 2016, the arrival of a slightly larger model, designed and built to the same family-friendly blueprint, is good reason for a positive outlook. After all, the ability of the smaller boat to combine a broad alfresco cockpit with four-berth accommodation and class-leading headroom was impressive. True, the low-slung windscreen was an issue and the fit-out and finish was flawed in parts, but there’s no doubt that, with its extra scale and its option of a more secure and protective hard top, the new 33 has all the hallmarks of a serious contender. 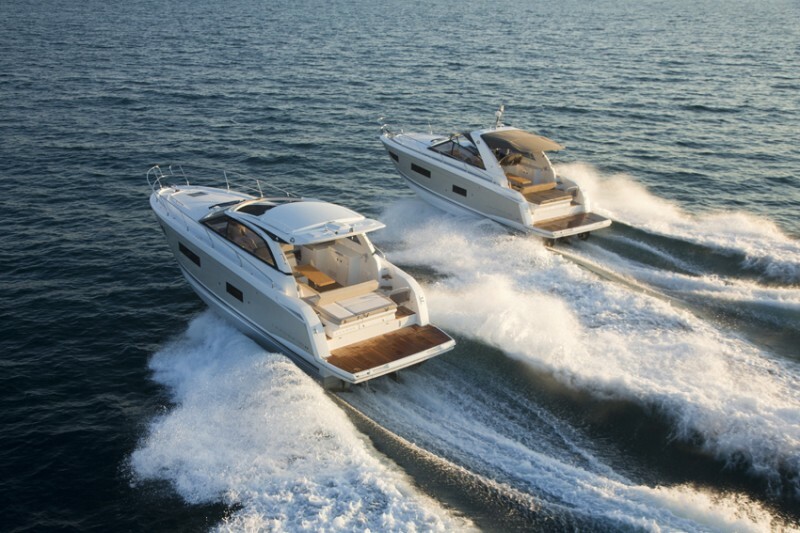 A pair of Volvo Penta’s D3 220s take the Leader 33 up to and just beyond the 30 knot mark. When you step into the starboard side of the cockpit from the big aft swim platform, it’s plain that the 33’s open space is all about communal gatherings. 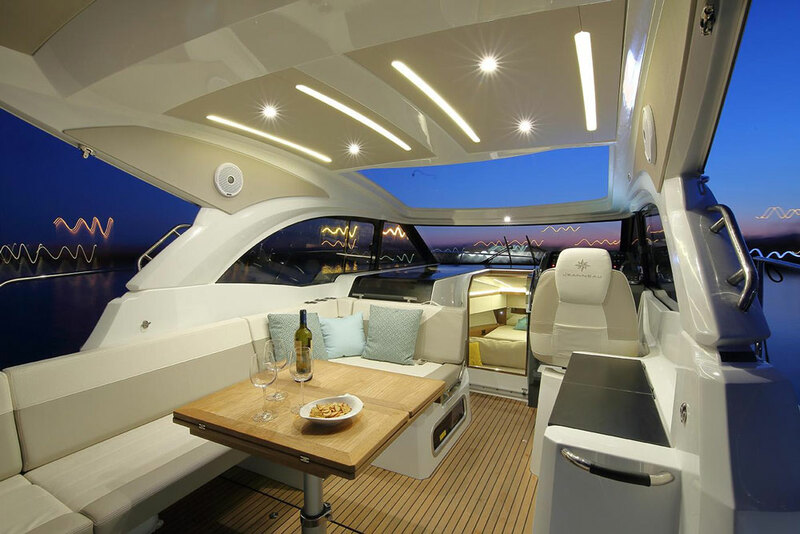 Other than a permanent galley that butts up against the back of the helm seat, all you get is an extendable dining table orbited by bench seating that runs all the way up the port side, from the aft bench to the two-man passenger’s seat. To help increase its versatility, that passenger’s seat can be swung in its entirety to face forward or to drop down and face aft, as an integrated part of the dining station. In line with current fashions, the backrests at the aft end of the cockpit fold down, one to the port side and the other over the swim platform. The intention, presumably, is to expand the lounging space for sun-loving guests–but in truth, this element feels like an unresolved afterthought. While the aft cushion is just about serviceable, the port cushion merely seems to blockade the port walkway. Like the awkward hinging footrest and the absence of stowage for small items at the helm, it’s a feature that raises more questions than answers. And yet none of this can mask the fact that, for those who like to sip wine, nibble canapés and chew the cud, the 33’s spacious and elegant cockpit does a very sound job indeed. 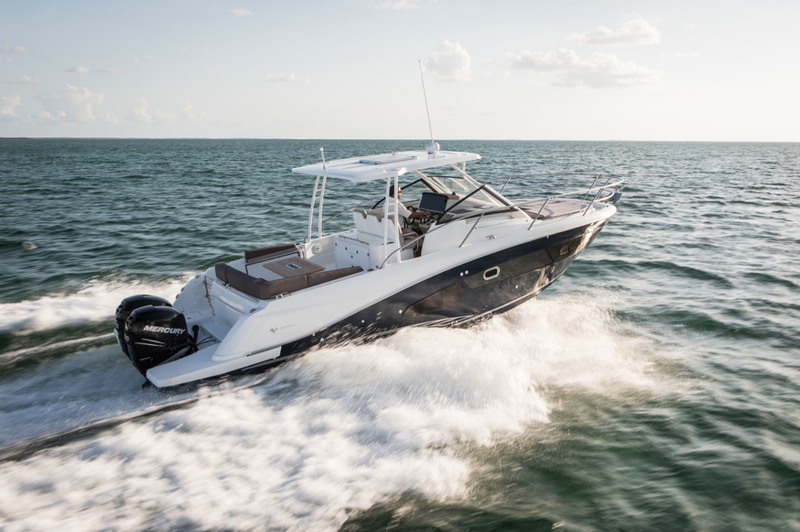 Entertaining or dining, the Leader 33 has a cockpit that can fit the bill. When you step down into the central section between the two cabins, the calibre of the space is immediately impressive for a boat of this scale. It features a starboard head compartment with shower, plus a galley to port–and both the headroom and the ingress of natural light are really first-rate. As a six-footer the freedom to move is very pleasing, but even a man six inches taller than me could enjoy these spaces with room to spare. As for the light, it seems to flood in from everywhere: from the overhead skylights in the navigator’s console top, from the full-height access door at the top of the steps, and from the long hull windows above the galley work surface. It reflects and bounces from the pale headliner and the pearly-white cupboard doors, generating an omnidirectional brightness that makes this region of the boat feel wonderfully open. The most noteworthy feature is probably the aft-facing lounge with removable dining table that sits at the foot of the forward berth. With the table in place and the sliding door open, you can seat four people in comfort without compromising integration with the galley and the forward part of the cockpit. It would be just the place for those in the master cabin to enjoy a nightcap with those in the guest double, before sliding the doors closed, re-establishing your privacy and having a good night’s sleep. Okay, so it takes a bit of manual effort to rig and de-rig the table (or to convert the settee into a berth and back again) but for a 33-footer, versatility of this advanced level is to be applauded. With the forward cabin doors open, the galley, settee, and forward stateroom enjoy social integration. As we all know, comfy beds and sociable cockpits don’t count for much if a boat soaks you to the skin, scares you witless, or beats you up en route to your lunch spot—but happily the Leader 33 feels very well judged. From a standstill you hit plane within seven seconds, before pushing on to 30 knots in about 20 seconds. You can eek out another 2.4 knots if you keep the throttle pinned and execute subtle tweaks with the tabs and trim. 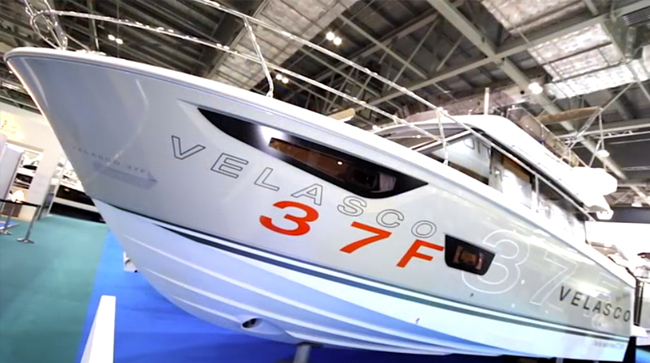 What’s of more interest is the fact that the helm responses of the Leader 33 are so reassuring. Even when the seas kick up, there’s enough dexterity and quick-wittedness to enable you to pick your way through a seascape with genuine relish. Of course, it’s not a razor-sharp drive and as a five-ton boat with 440 diesel horses, it was never likely to be. 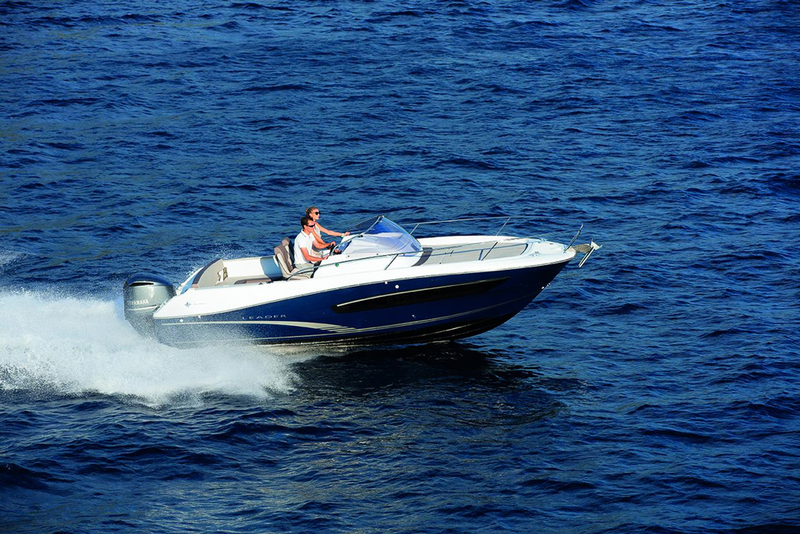 Those in need of more sporting aggression can always up the ante with MerCruiser’s 6.2-litre MPI 300s. This new 33 seats and sleeps the same number of people as the established Leader 36. It also boasts fuel and water capacities of a similar order, and by adopting the same principles in layout, subtly tweaked with extra flexibility it achieves pretty much everything the 36 does—but on a smaller, more affordable platform. 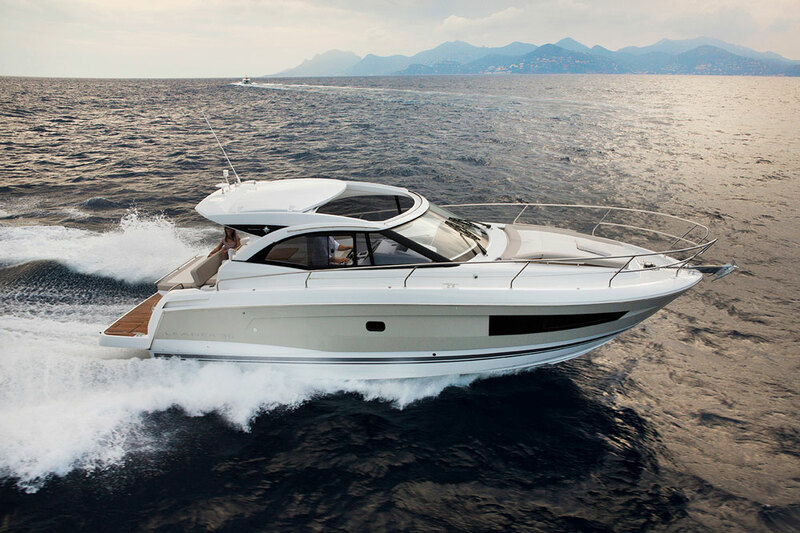 The Leader 33 will prove to be an effective solution to the challenges of the mid-range family sports cruiser. Other Choices: Buyers in search of a more traditional look and feel may gravitate towards the Marlow Pilot 34, while those preferring a flybridge on a boat of this size could look at the Carver C34. 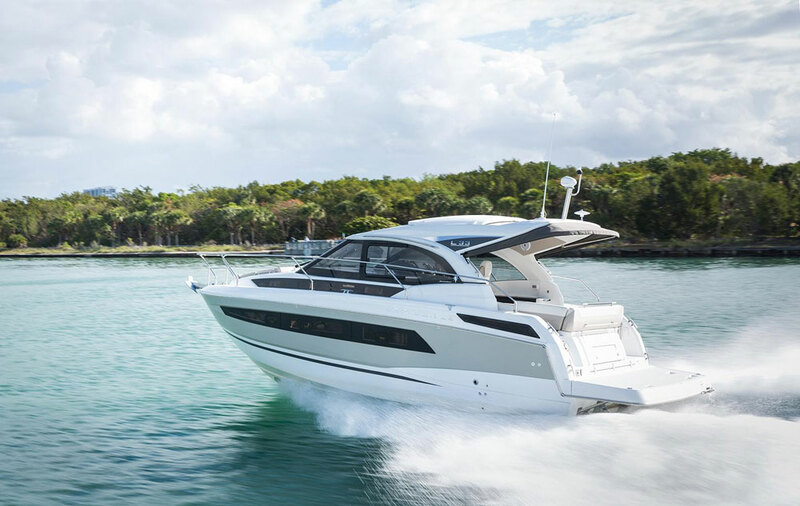 The Regal 35 Sport Coupe and the Sea Ray 350 Coupe would provide examples of slightly larger competitors. 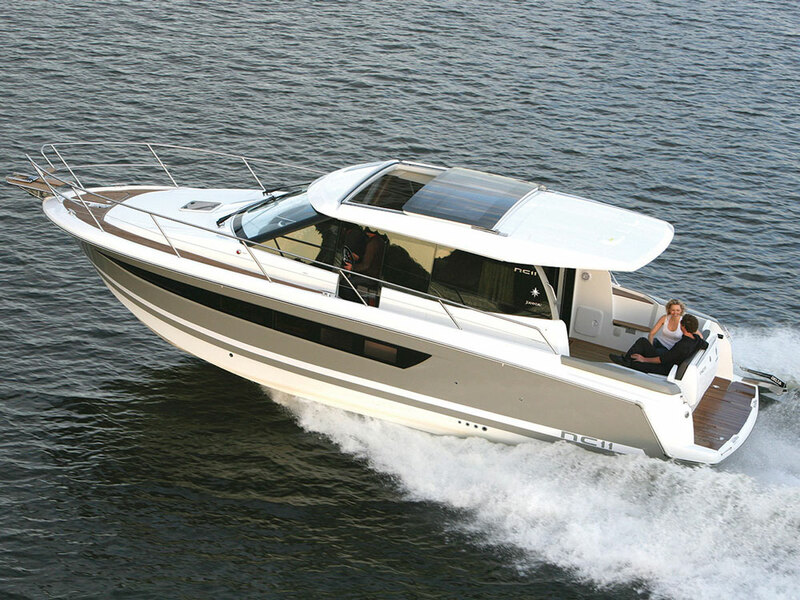 See Jeanneau Leader 33 listings.